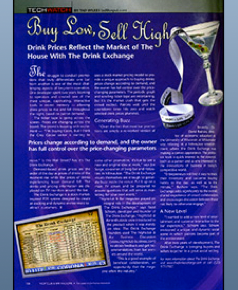 The Drink Exchange is a Stock Market pricing system designed to increase profit, attract patrons, and create an exciting and dynamic environment. It's easy, just purchase a drink featured on the TV Display and watch the prices change! When it comes to competition for customers, The Drink Exchange is the X-Factor. 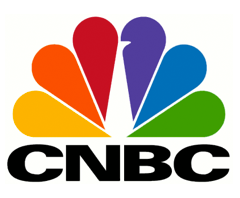 The Drink Exchange was featured on the MSNBC Show "Your Business". Watch the segment below to see the Drink Exchange in action and learn why the Drink Exchange is successful. 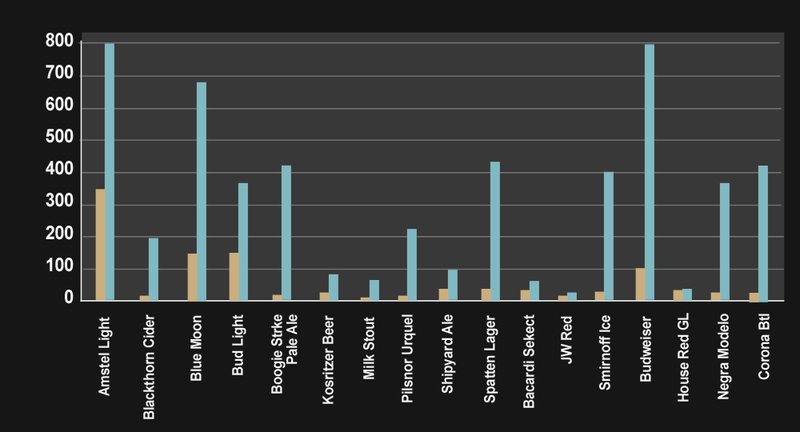 Sales increase so much for the listed items that Drink Exchange bars are often compensated by their liquor distributor to list specific items in the system. 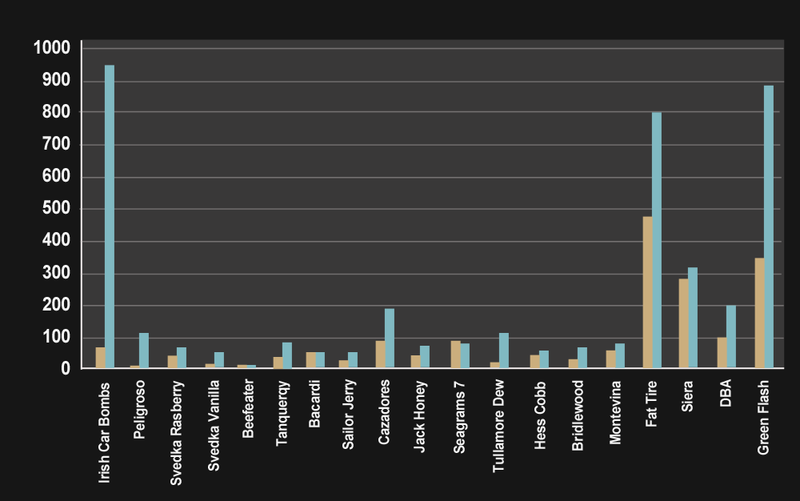 The data on the right shows the sales increases at various Drink Exchange bars throughout the country. Don't worry, there's no math involved for the bartenders. 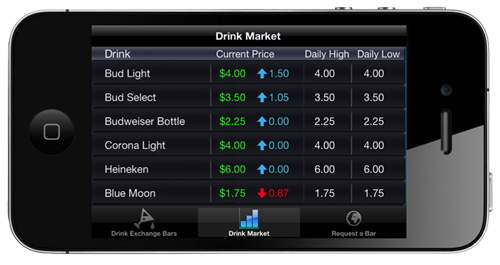 The Drink Exchange integrates directly with select Point of Sales Systems. It's like ringing in anything else. If your POS system isn't listed below we're happy to integrate with your preferred POS provider. Get set up with a Drink Exchange mobile app that lets your patrons view current drink prices at any time and at any place. The mobile app is a great, viral method for marketing your bar and attracting patrons. The Drink Exchange connects to your TV's via hdmi, vga, or wirelessly. You can pick and choose the TV's that you want to show the drink prices. We recommend 2-3 TV's for the average sized bar. (optional) Some Drink Exchange establishments go the extra mile and display the drink prices on a scrolling LED sign in addition to the standard TV setup. The Drink Exchange uses a highly specialized, fully-customizable algorithm to change the drink prices according to the Market's Demand. Utilize the algorithm to increase profits and push inventory. How does Trivia benefit my establishment? Proven to increase the length of time patrons stay in the establishment. 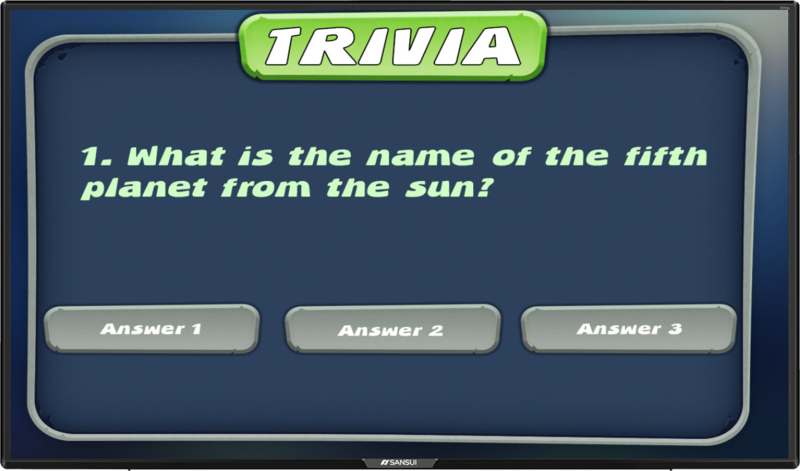 Trivia differentiates your establishment and offers patrons variety. Simply plug an Amazon Fire TV Stick into the side of the TV and navigate to the trivia game. The Amazon Fire TV Stick is included when you sign up for the Trivia service, or you can purchase one for $39.99 at your local Best Buy. The Drink Exchange is priced so that you profit by using it. Click the Join button and we'll send you pricing information. 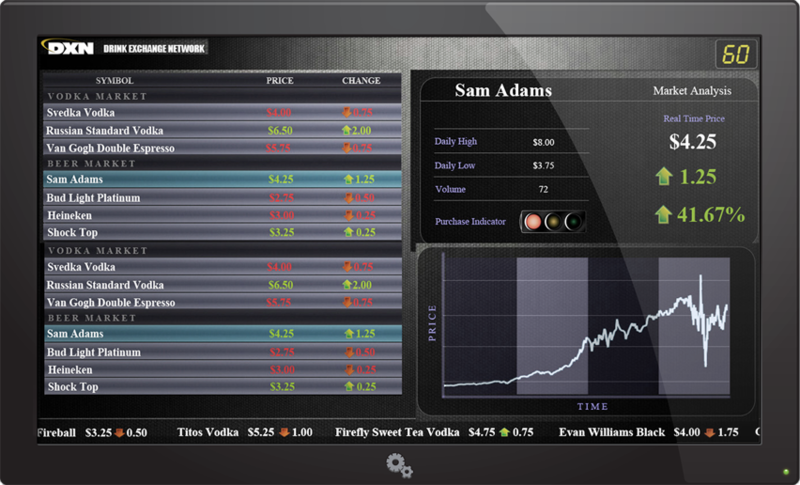 When you purchase the Drink Exchange you receive the Drink Exchange computer system, Drink Exchange software, POS integration, setup, consulting, and unlimited support. You can be up and running with the Drink Exchange within a week. 1) Can I Use The Drink Exchange for more than just Happy Hour? Sure can! The Drink Exchange can be operated in any manner that you see fit. The more eyes on the system the better. We recommend using the system at least 3 hours a day for happy hour. However, many locations use the Drink Exchange 24/7 as the theme of the location. Turning the Drink Exchange on or off is as simple as pressing a button on the software. 2) Will The Drink Exchange help me with my marketing strategy? Absolutely! 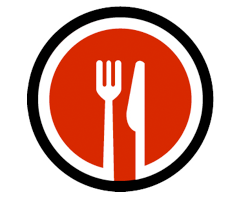 Word of mouth spreads quickly, but marketing the system with simple fliers at each table or at the bar is recommended. We can provide this for you free of charge. 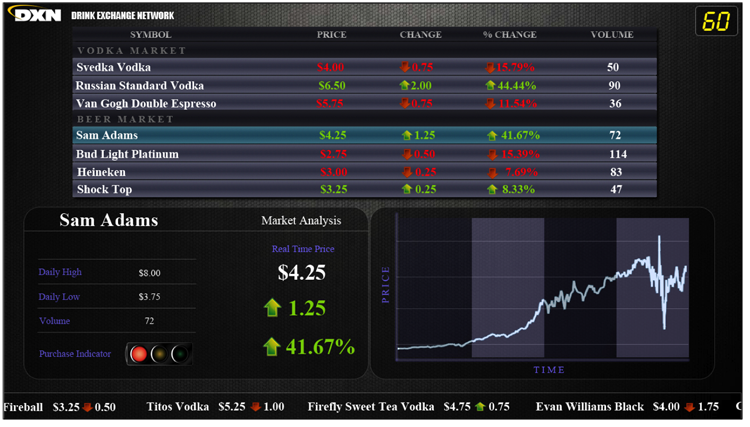 3) How does the Drink Exchange increase my revenue and profit? 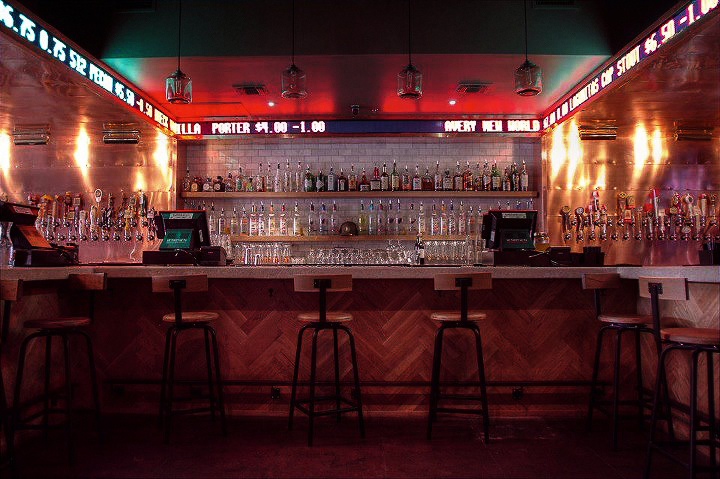 -	Increased patronage – The Drink Exchange is a unique concept. As word of mouth spreads you’ll notice patrons come to the bar just to see the Drink Exchange in action. 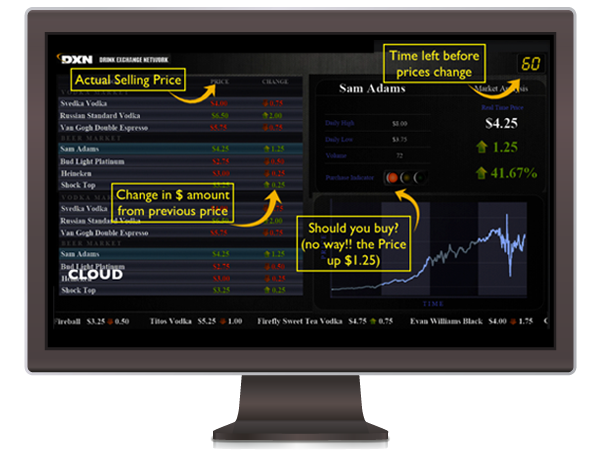 -	Increased Profits – By listing your high profit margin items in the system you will earn a higher profit margin as the Drink Exchange items sell at a higher rate. In addition, patrons will capitalize on “good deals” and purchase more items than usual. -	Liquor Distributor Kickbacks – Most Drink Exchange clients are being compensated by their liquor distributor to assure that specific items are listed in the system. 4) How easy is the setup process? When you purchase the Drink Exchange the Drink Exchange computer system is shipped to you. The computer system is connected to your POS router and to the TV’s via HDMI or VGA. From here the Drink Exchange technicians will access the system remotely and configure the POS integration. “Have a question? Please send us a message and we’ll reply within 24 hours”.